From The Story of Primrose. 1831-1895. 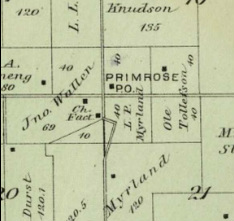 Robert Spears and George Patchin were credited with getting the first post office for Primrose Township in NE4 S19 (top map). In 1847 the post office was established in Robert Spears' house. Spears suggested the name Primrose from an old folk song. Mrs. Spears did most of the actual work in the post office. The mail came from Madison on the way to Wiota in Lafayette County once a week. George Patchin was the first mail carrier followed by Joe Pain and J. Eaton. In 1850 (1851*) George Patchin became postmaster until Robert Spears resumed in 1854 (1851). Then these followed: in 1865 (1854)- David Ash, 1867 (1865)- Freeman Ash, 1867 (1867)- William L. Hollar, 1868 (1867)- John Hollar, 1870 - Jacob G. Hanna. At this point the post office was moved to the center of the township. These follow as postmaster: in 1877- Annie G. Hanna, 1887- Lars Peterson, 1887- Ole Peterson, 1889- William Dahl. It closed in 1900. From History of the Township of Primrose. Mary Hanna Zumbrunnen, 1990, the dates of service of the postmasters differ (*noted above in parenthesis). The post office moved in 1870 to NE4NE4 section 21 in the home of Jacob G. Hanna (center map). In 1877 it moved again to SE4SE4 of section 16 to Amund S. Holland's farm (bottom map). In 1887 after Annie Hanna died, Hans O. Skuldt became postmaster and the office was moved to his farm in SW4NE4 section 15. Later in 1887 with Lars Peterson Myrland as postmaster the post office was again moved to his farm in SW4SW4 Section 16 (bottom map). In 1896 the post office was moved to Mt. Vernon with William Dahl as postmaster. 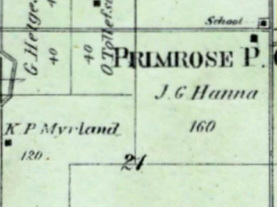 The original building built as the post office on the Holland farm was moved east of the Hanna School on the Hanna Estate in NW4NW4 section 22 (just east of area on center map). Ann M. Hanna, the daughter of Jacob and Anna, became postmistress until the post office closed in 1904. * dates from The Story of Primrose. 1831-1895. (dates) from History of the Township of Primrose. NE corner of Primrose Center Rd.